HETG is the High-Energy Transmission Grating (Canizares et al. 2005). In operation with the High Resolution Mirror Assembly (HRMA) and a focal-plane imager, the complete instrument is referred to as the HETGS - the High-Energy Transmission Grating Spectrometer. The HETGS provides high resolution spectra (with E/∆E up to 1000) between 0.4 keV and 10.0 keV for point and slightly extended (few arcsec) sources. Although HETGS operation differs from proportional counter and CCD spectrometers, standard processing of an HETGS observation produces familiar spectrometer data products: PHA, ARF, and RMF files. These files can then be analyzed with standard forward-folding model fitting software, e.g., Sherpa, XSPEC, ISIS , etc. The HETG itself consists of two sets of gratings, each with different period. One set, the Medium Energy Grating (MEG), intercepts rays from the outer HRMA shells and is optimized for medium energies. The second set, the High Energy Gratings (HEG), intercepts rays from the two inner shells and is optimized for high energies. Both gratings are mounted on a single support structure and therefore are used concurrently. The two sets of gratings are mounted with their rulings at different angles so that the dispersed images from the HEG and MEG will form a shallow X centered at the undispersed (zeroth order) position; one leg of the X is from the HEG, and the other from the MEG. The HETG is designed for use with the spectroscopic array of the Chandra CCD Advanced Imaging Spectrometer (ACIS-S) although other detectors may be used for particular applications. A summary of characteristics is given in Table 8.1. The Instrument Principal Investigator for the HETG is Dr. Claude Canizares of the MIT Center for Space Research. See Canizares et al. (2005) for a thorough description of the instrument and its performance. An example of an HETGS observation is presented in Figure 8.1 using data from an observation of Capella, Obsid 1318. The top panel shows an image of detected events on the ACIS-S detector with the image color indicating the ACIS-determined X-ray energy (see WWW version if this is not in color). In this detector coordinate image (TDETX, TDETY), the features are broad due to the nominal dither motion which serves to average over detector non-uniformities. The ACIS-S chips are numbered S0 to S5 from left to right, with the aim point in S3 where the bright zeroth-order image is visible and includes a vertical frame-transfer streak (a trailed image). The HRMA optical axis passes through S3 approximately 6 mm from the S2-S3 chip gap. For further information see Figure 6.1 and related text. HETG-diffracted photons are visible in Figure 8.1 forming a shallow "X" pattern; the full opening angle between the HEG and MEG spectra is 9.96°. The back illuminated (BI) chips are S1 and S3. The S1 location was chosen to enhance the first order MEG spectrum since back illumination provides higher efficiency below 1 keV. The location of the zeroth-order for any particular observation, however, may be adjusted by offset pointing in order to select the energies of the photons that will be placed in the gaps between the chips. Details on gaps are presented in Section 8.2.1. The middle panel of Figure 8.1 shows an image after the data have been aspect corrected and data filters applied to include only valid zeroth and first-order events. Note that this image was created using Sky coordinates that were rotated and had their y-axis sign "flipped" to match the detector coordinates view in the top panel. 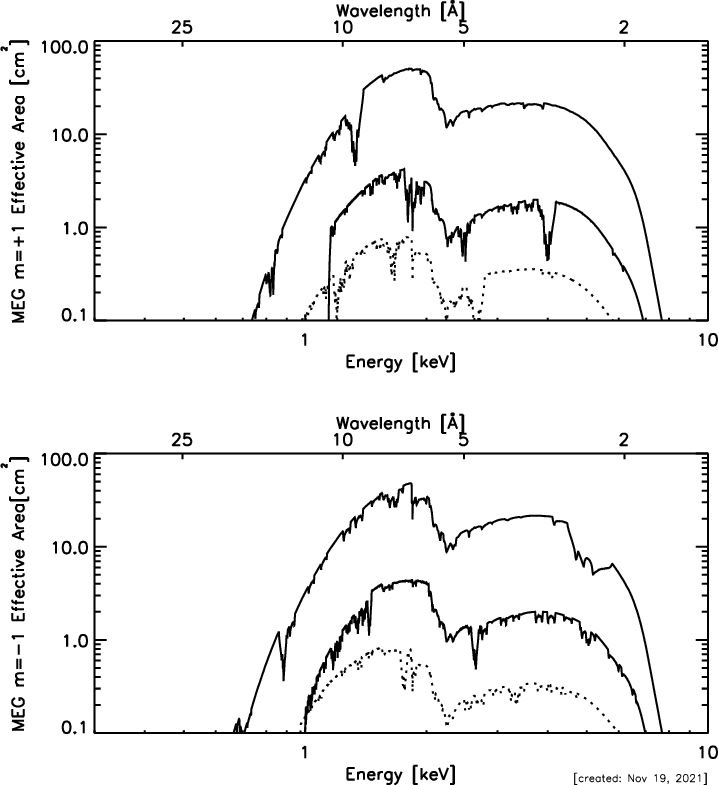 The lower set of panels shows an expanded view of the MEG minus-first-order spectrum with emission lines clearly visible. Wavelengths are assigned based on the diffraction angle of the events, that is, how far the events are from the zeroth-order image. Using the grating equation in Section 8.1.3, absolute wavelengths can be assigned based on the dispersion angle. A spectrum of the source is then created by binning the events into energy or wavelength bins; the spectrum from another Capella observation is shown in Figure 8.2. Note: The dispersion distance on the detector is essentially linear in wavelength. Thus, wavelength is the natural unit for this high-resolution X-ray spectrometer. The conversion between energy and wavelength is provided by the relation: E ×λ = hc = 12.39852 keVÅ. Each of the "arms" of the HETGS diffracted X pattern yields a first-order spectrum identified by type (HEG or MEG) and sign of the order (plus or minus). Using ARF's (ancillary response files) and RMF's (response matrix files) these spectra can be analyzed in an XSPEC-like framework. 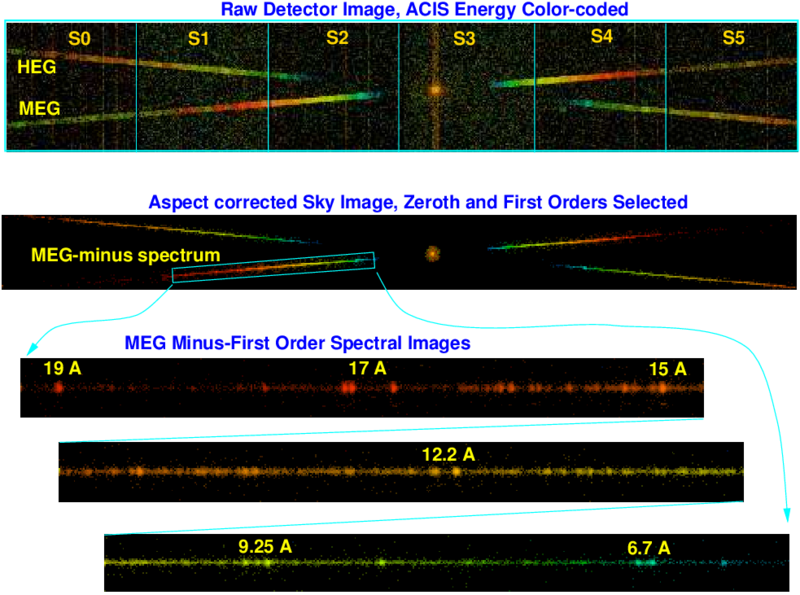 Additionally, the CXC software package "Interactive Spectral Interpretation System" (ISIS, http://space.mit.edu/ASC/ISIS/) can be used to identify spectral lines, e.g., as seen in Figure 8.2. Figure 8.1: HETGS observation of Capella, Obsid 1318. The top panel shows an image of detected events on the ACIS-S detector with the image color indicating the ACIS-determined X-ray energy. The bright zeroth-order image is visible on CCD S3 and includes a trailed image (the vertical frame-transfer streak). Diffracted photons are visible forming a shallow "X" pattern; the HEG and MEG spectra are indicated. The images are broad due to dither of the spacecraft. The middle panel shows an image after the data have been aspect corrected and selections applied to include only valid zeroth and first-order events; note that the Y axis has been flipped from the normal Sky view to match the detector coordinates view in the top panel. 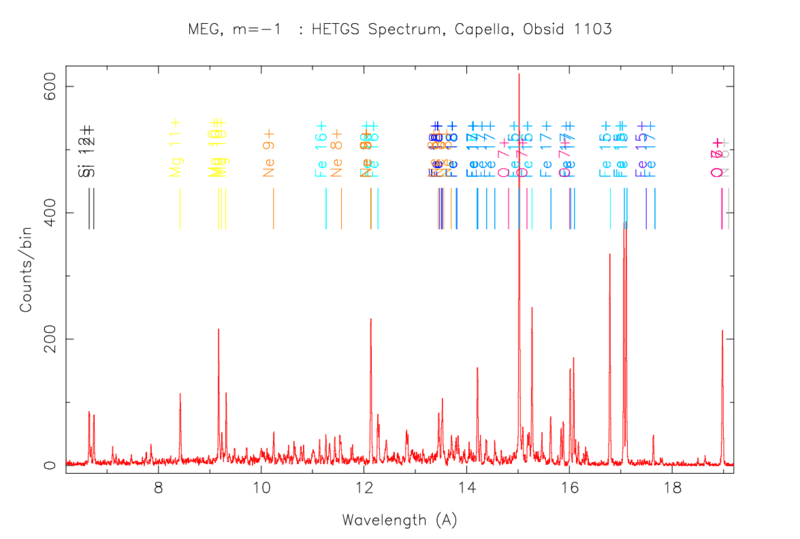 Finally, the lower panel shows an expanded view of the MEG minus-first-order spectrum with emission lines clearly visible. Figure 8.2: HETGS Capella spectrum, MEG m=−1, Obsid 1103. The first-order events identified in the MEG minus-side "arm" of the HETG X pattern are assigned wavelengths by CXC pipeline software according to the grating equation and known instrument parameters. These values are then binned to produce a pulse height analysis spectrum ( pha2.fits file) which is plotted here. The ISIS software package available from the CXC has also been used to indicate the location of expected emission lines based on a simple source model. The HETGS allows one to probe the physical parameters of emitting regions of all classes of X-ray sources, including stars, X-ray binaries, supernova remnants, galaxies, clusters of galaxies, quasars, and interstellar and intergalactic material. Plasma diagnostic techniques applied to emission lines, absorption lines and absorption edges will convey source properties such as temperatures, ionization states, densities, velocities, elemental abundances, and thereby structure, dynamics, and evolution of various classes of sources. The energy band amenable to observation is extremely rich in lines from both coronal and photo-ionized plasmas, containing the L-shell lines from ionization stages of Fe XVII to Fe XXIV and the K-shell lines of hydrogenic and helium-like ions of oxygen through nickel. The 6 keV Fe K lines are well within the observable band. The highest resolutions available will also allow detailed study of motions through Doppler line shifts in supernova remnants, X-ray binaries, turbulent intra-cluster or intra-galactic gas, or early-type galaxies in clusters. Although gratings have flown on Einstein and EXOSAT, the HETGS shares only the basic operating principles with these. Advanced grating technology has enabled achievement of greater efficiency and increased dispersion. The Rowland geometry of the grating plate and spectroscopic arrays maintains the telescope focal properties in the dispersion direction by minimizing dispersed image aberrations and hence contributes to improved spectral resolution. where m is the integer order number, λ is the photon wavelength in angstroms, p is the spatial period of the grating lines, and β is the dispersion angle. A "normal" undispersed image is formed by the zeroth-order events, m=0, and dispersed images are formed by the higher orders, primarily the first-order, |m|=1. The HETGS-faceted Rowland design is shown in Figure 8.4. The "Rowland circle" is a circle whose diameter is simply the distance from the grating that would lie on the optical axis to the point in the focal plane where the zeroth order image is placed. The "Rowland torus" is formed by rotating the circle about the line in the dispersion direction going through the on-axis focus. Individual grating facets are mounted such that their centers lie on the torus . In the figure, the axis of the torus is perpendicular to the page for the side view and lies in the plane of the top view. Ideally, the detector is shaped to follow the counterpart Rowland torus in the image plane. The result is that the telescope focal properties in the dispersion direction are maintained for a large range of diffraction angles, β, thereby minimizing any grating-added optical aberrations. An important parameter of the HETGS is the Rowland spacing, the distance from the outer intersection of the HETG axis and Rowland Circle to the HRMA focus. This Rowland spacing is what determines the value of β in the grating equation. The value of the Rowland spacing is listed in Table 8.1. Order overlap and source confusion can be discriminated by the intrinsic energy resolution of the CCD detector (ACIS-S is the preferred detector for HETG spectroscopy since it has intrinsic energy resolution and so can separate orders; the HRC may be used if high time resolution is desired, but this choice is at the price of using the focal-plane detector's energy resolution to aid in order separation). The form of a spectral image on the ACIS-S array is shown in Figure 8.1. The spectroscopic array spans about 8 arcmin × 48 arcmin of the sky, though image quality and resolving power degrade rapidly for sources more than about 4 arcmin off-axis. For an on-axis source, the detector edge in the dispersion direction causes a low energy cutoff of the spectrum at about 0.4 keV for the MEG and 0.8 keV for the HEG. Order selection and chip gaps are described more fully in Section 8.2.1. Figure 8.4: The Rowland geometry is shown schematically. In the "Top" view, we are looking across the dispersion direction. The diffraction angle is β. The geometry is such that converging rays diffracted at a specific angle by the gratings (which are located on the Rowland circle) will converge to a point that is also on the Rowland circle. The dotted lines represent zeroth-order rays and the solid lines represent the grating-diffracted first-order rays. The bottom panel ("Side" view) looks along the dispersion direction at rays from a set of gratings arranged perpendicularly to those in the "Top" view and schematically shows the astigmatic nature of the spectrally focused image: since the converging rays have not yet reached the imaging focus, they are extended across the dispersion (by less than 100 microns). The HETG support structure (HESS) is a circular aluminum plate (110 cm diameter by 6.35 cm thick) which can be swung into position behind the HRMA. Mounted on the HESS are 336 grating facets , each about 25 mm square. The position and orientation of the HESS mounting surfaces have been designed and machined to place each grating center on a Rowland torus of diameter 8633.69 mm. A detailed drawing of the HETG (HESS plus facets) is shown in Figure 8.5. The gratings cover the annular regions through which the X-rays pass. The 192 grating facets on the outer two annuli (MEG) have a period of 4001.95 Å. Tiling the inner two annuli are 144 (HEG) gratings, which have a period of 2000.81 Å (see Table 8.1). The two sets of gratings are mounted with their rulings at different angles so that the dispersed images from the HEG and MEG will form a shallow X centered at the undispersed (zeroth order) position; one leg of the X is from the HEG, and the other from the MEG. See Figure 8.1 for an example. The HETG grating facets are composed of electro-plated gold bars supported on a polyimide substrate, as shown schematically in Figure 8.6. The grating bar design parameters, height and width, are nominally chosen to reduce zeroth-order and maximize first-order intensities. Choosing to have the bar width one-half of the grating period suppresses even orders and provides maximum 1st order efficiency for a rectangular profile; this is closely achieved for the MEG gratings. For the HEG gratings, the bar is wider and results in a higher 2nd order efficiency and reduced 3rd order efficiency. The bar height choice "tunes" the efficiency peak in energy by allowing X-rays to constructively interfere in first order in the region where the gold is partially transparent, primarily above 1.2 keV. Figure 8.5: A front (upper) and side (lower) view of the HETG support structure (HESS). The grating facets are mounted to intercept the X-rays as they exit the HRMA; the front view is from the HRMA i.e., what an approaching X-ray would see. In the side view, the left cross-section shows that the four support rings are in different planes due to the Rowland curvature. The right cross-section is through a radial rib at one of the three mounting "ears". Figure 8.6: Cross-sections of the MEG and HEG membranes. The soap-bubble-thin membranes of the HETG consist of gold bars attached to a polyimide support layer. The MEG grating bars are close to rectangular, typically with a height of 3600 Å and a bar-to-period fraction of 52%. The HEG bars have a crudely trapezoidal shape, narrower on the polyimide side as shown, typically 5100 Å high with an effective bar-to-period fraction around 60%. When observing a point source, the HETGS can be viewed as a black-box spectrometer characterized by its Effective Area and Resolution. More specifically an HETGS count spectrum produced by standard analysis (a PHA file) can be related to the source spectrum through a grating ARF and grating RMF; because of the spatially-dispersive operation of the HETGS, the RMF is also referred to as the Line Response Function, LRF. Four first-order spectra are obtained from an observation corresponding to the four whiskers of the dispersed "X" pattern: the plus and minus first-orders of the HEG and MEG gratings. Standard CIAO tools produce these PHA files, ARFs, and RMFs for observers' use. In the sections that follow, information on the HETGS Effective Area (ARFs) and Resolution (RMFs/LRFs) are given with an examination of the components and effects that contribute to them. In addition two other characteristics of the HETGS are briefly presented: the Background event rate for an extracted spectrum and the Absolute Wavelength accuracy. The HETGS effective area, as encoded in the ARF, depends on the HETG efficiency coupled with the HRMA effective area and the ACIS efficiency. Additional effects can arise from the process of selecting events, the effect of chip gaps, and the use of "ACIS ENERGY" to do order sorting. In this chapter we use the term ACIS ENERGY to describe the energy deduced from the ACIS pulse height. Combining the HETG diffraction efficiencies with the HRMA effective area and the ACIS-S detection efficiency produces the system effective area as a function of energy, described by an "ancillary response file" or ARF. Plots of HETGS ARF's are shown in Figures 8.7 and 8.9 which are plotted with log vertical axes; the same plots with linear vertical scale are shown in Figures 8.8 and 8.10. The values are plotted from ARF files created by the CXC CIAO tool fullgarf. The effective area includes the effect of molecular contamination on the ACIS filter (projected to the middle of the Cycle). The nominal plots shown here are for qualitative reference only; because the fullgarf tool also accounts for a variety of other effects, e.g., dither motion, bad pixels, QE non-uniformity, etc., grating ARFs are custom made for a given observation. The details of the calibration of the ARF are discussed in Section 8.3. Since first-order photons from both the HEG and MEG gratings provide information, to compare the HETGS with other instruments, it is useful to plot the total HETGS effective area (the combined plus and minus first-order areas of both the HEG and MEG); this is shown by the solid curve in Figure 8.11. During an observation the zeroth-order photons from HEG and MEG form a single zeroth-order image; the effective area for this zeroth-order image is also plotted on this figure (dotted line). Note the dips caused by the gaps between chips in these figures. The observatory is dithered to spread the signal across a large number of pixels. For HETGS observations, sinusoidal motions with 8 arcsec amplitude in spacecraft Y and Z axes are used with periods of 1000.0 and 707.0 sec, respectively, creating a Lissajous pattern (see Section 5.8.2). When the combination of the chip gaps and dither are accounted for, a "pitch fork" dip occurs at each gap region in the ARFs. Although effects of this motion are removed in on-ground processing, observers are advised to avoid placing spectral features of interest near the gaps. More information concerning gaps are in the next section. The effective areas shown in Figure 8.7-8.11 are based on an integration over the full LSF. Most of the flux in a line will be contained within a circle of diameter 4 arcsec. The user might wish to note that in data processing, the pipeline software keeps only events that are in a spatial window that lies within 3 arcsec of the dispersion axis. This aperture guarantees that a high fraction, 97-99%, of the signal flux is retained while minimizing the contribution of the background. Further discussion of the spatial distribution of events can be found for the HRMA PSF in Chapter 4 and for the HETGS in Section 8.2.2 below. 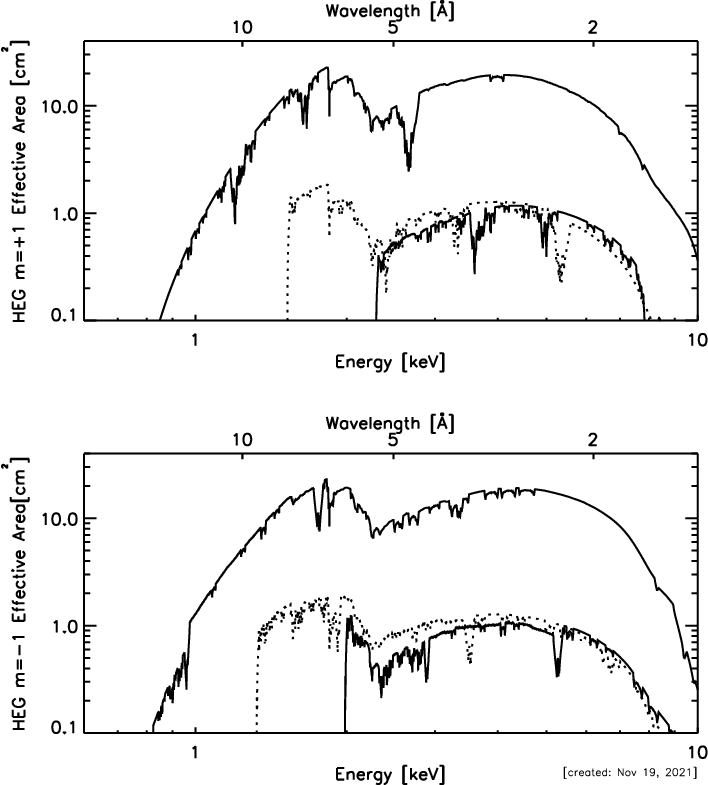 Figure 8.7: The HETGS HEG effective area, integrated over the PSF, is shown with energy and wavelength scales. The m=+1,+2,+3 orders (falling on ACIS chips S5, S4, S3; left to right) are displayed in the top panel and the m=−1,−2,−3 orders (falling on ACIS chips S0, S1, S2; left to right) are in the bottom panel. The thick solid lines are first order; the thin solid line is third order; and the dotted line is second order. Figure 8.8: The HETGS HEG effective area: same caption as previous figure, except the vertical scale is now linear. Figure 8.9: The HETGS MEG effective area, integrated over the PSF is shown with energy and wavelength scales. The m=+1,+2,+3 orders (falling on ACIS chips S5, S4, S3; left to right) are displayed in the top panel and the m=−1,−2,−3 orders (falling on ACIS chips S0, S1, S2; left to right) are in the bottom panel. The thick solid lines are first order; the thin solid line is third order; and the dotted line is second order. Figure 8.10: The HETGS MEG effective area: same caption as previous figure, except the vertical scale is now linear. Figure 8.11: The modeled total first-order (solid curve) and zeroth-order (dotted curve) effective area, integrated over the PSF, of the HRMA-HETG-ACIS-S combination, as a function of energy. The first-order data are the same as those plotted in Figures 8.7 and 8.9. The plotted first-order values are the sums of the area at a particular energy from both orders (+/-) of both MEG and HEG spectra. Both a log-log and a log-linear version are shown. The HETG contribution to the effective area comes in through the efficiencies of the HETG gratings; the values of these are shown in Figure 8.13. All calibration data support the modeling assumption that the positive order efficiencies are equal to the negative order efficiencies. These efficiencies are primarily based on laboratory measurements of each facet, synchrotron reference grating corrections, improved polyimide transmission models, and updated gold optical constants as described in Flanagan et al., (2000). Slight adjustments to the HETG efficiencies have been determined using in-flight data by comparing the HEG and MEG spectra of many sources. The adjustments are mostly less than 10%; see Marshall (2005) for details. In an update (Marshall 2012) included in CalDB 4.4.7 and later, the HEG and MEG agree now at the ∼ 1% level. A number of systematic effects at the 10% level have now been accounted for in the HETGS effective area via adjustments to the grating efficiencies. 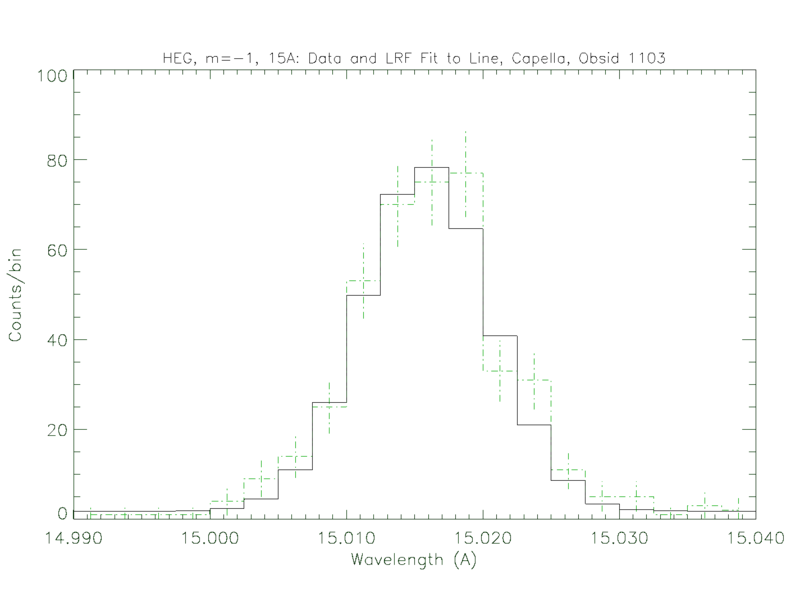 Observations of blazars (Marshall 2012) have been used to verify these corrections. Relative systematic errors from fits to logarithmic parabolas (with fixed, source-dependent column densities) are generally less than 3% (0.5 - 8.0 keV) on small scales (see Figure 8.12). Preliminary results from cross-calibration with XMM-Newton indicate that measured fluxes agree to better than 10% (Smith & Marshall 2012). Cross-calibration with XMM-Newton and other X-ray telescopes (NuSTAR, Swift, and Suzaku) was addressed for a limited energy range by Madsen et al. (2016), who found differences of order 10% or less above 3 keV and as much as 15% against the XMM-Newton pn. Figure 8.12: The average residuals to fits to the HETGS data for BL Lac objects using logarithmic parabola continuum models. For most of the HETGS range, the systematic deviations are not significant or are less than 3%. See Marshall (2012) for details. Figure 8.13: HEG (upper panel) and MEG (lower panel) efficiencies as a function of energy. The values plotted are the mirror-weighted efficiency into a single plus, minus, or zero order (labelled on the right edge). The dashed line is zeroth order; the thick solid line is first order. Note that the relative strengths of the third orders (thin solid lines) are comparable, whereas the second order strengths (dotted lines) are significantly different between the HEG and MEG. One of the advantages of using the ACIS-S as the HETG read-out detector is the ability of ACIS to determine the energy of detected X-rays. This crude (by HETGS standards) energy measure can be used to determine the diffraction order of the photon, i.e., perform "order sorting", as shown in the "banana plot" of Figure 8.14. During data analysis, this filtering is accomplished by utilizing two of the data columns supplied in the level 1.5 (or 2.0) FITS data file: the ACIS-determined energy, ENERGY, and the dispersion distance, mλ = TG_MLAM. Ideally this order sorting would have perfect efficiency, that is, all first-order events would be correctly identified. In practice, a high sorting efficiency is achieved by accurately calibrating the ACIS ENERGY values and by accepting events in a large ENERGY range. The slight efficiency corrections that do arise are included in the ARF through values in an order sorting integrated probability (osip) file. Figure 8.15 shows a closeup of the "banana plot" (ACIS-determined energy versus the dispersion distance in units of wavelength) for MEG minus-order events for an observation which exhibits pile-up (see Section 6.16) and thus mimics higher-order photons. 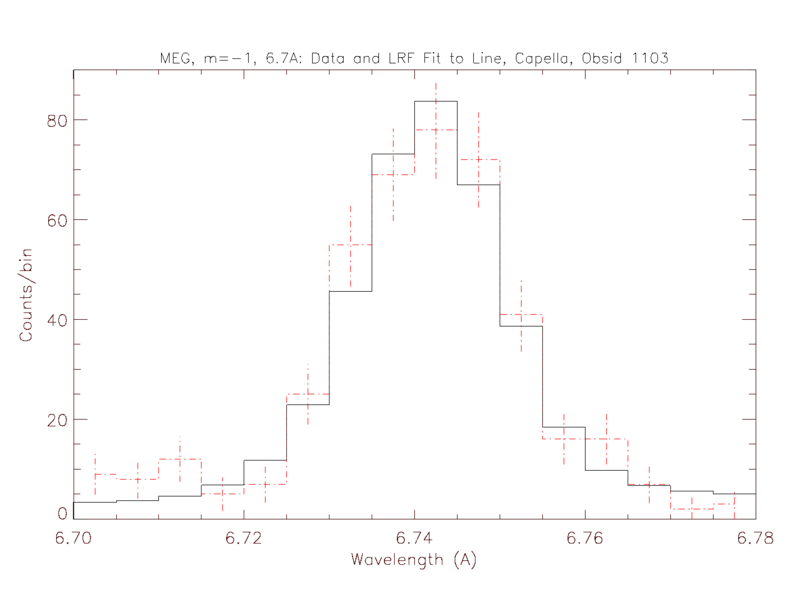 One can encounter pile-up even in the dispersed spectra. The effect is most likely seen in first order spectra when observing bright continuum sources such as those found in the Galactic bulge. Pile-up, when it occurs, is most usually found in the MEG first order spectrum near the iridium edge at 2 keV where the HETGS effective area is the highest. Users analyzing data should note that not correcting for pile-up may introduce an artificial absorption edge. In these cases users may well wish to examine the spectrum in the third order to either salvage or correct a result. Figure 8.14: HEG (upper panel) and MEG (lower panel) "Banana Plots". A useful look at the HETGS data is obtained by plotting the ACIS-measured event ENERGY as a function of m λ = TG_MLAM (or versus dispersion distance.) These "banana plots" are shown here for HEG and MEG parts of the Obsid 1318 Capella observation. The various diffraction orders show up as hyperbolae. Events can be assigned to a diffraction order based on their location in this space. By accurately calibrating the ACIS ENERGY and by taking an appropriate acceptance region, events can be sorted by order with high confidence and efficiency. A "zig-zag" in the m=−1 events pattern is visible around −10 Å in the HEG plot and is due to uncorrected serial charge transfer inefficiency in the BI device S1, which produces a slow variation of gain across a node. Figure 8.15: HETGS pile-up and higher-order events. Taking a close look at the MEG "banana plot" demonstrates how the ACIS ENERGY can be used to identify higher-order events and pile-up in an HETGS spectrum. The 3rd order of the ≈ 6.7 Å lines are clearly visible; the lines are only weakly present in 2nd order because the MEG 2nd order is suppressed. In comparison, the 15 Å line (and others) are so bright in 1st order that a fraction of the events ( ≈ 6 % here) pile-up and produce events with twice the ACIS ENERGY. Note that the 6.7 Å lines are better resolved in the high order spectrum. The ACIS-S array is made up of both back-illuminated (BI) and front-illuminated (FI) CCDs; chips S1 and S3 (see Figure 8.1) are BI devices and the rest are FI devices. These devices have different quantum efficiencies (QE) with the BI having greater sensitivity at lower energies; most notably the S1 BI device gives an increased effective area in the MEG minus first order between about 0.5 to 0.8 keV. The grating ARFs are created taking these QE differences into account. The nominal ACIS-S aim point is on chip S3, about 2.0′ from the gap between chips S2 and S3. Energies of gap edges in both dispersed spectra for the default aim point and for 3 offsets in both (+/-) Y directions are given in Table 8.2. For example, with zeroth order at the -0.66′ Y-offset position, the gap between chips S1 and S2 spans the energy range 0.829-0.842 keV in the MEG spectrum (lower energies on S1). The observer is advised to try to avoid placing known features of interest within three gap widths of the tabulated gap edges. All HETGS observations are nominally dithered with an amplitude of ±8′′. There will be reduced coverage in the spectral regions within one gap-width on either side of the gaps. The web-based Spectrum Visualization Tool http://cxc.harvard.edu/cgi-gen/LETG/alp.cgi displays where spectral features fall on the ACIS-S detector as a function of Y-offset and source redshift. The values in the table are based on an effective gap size of 0.502 mm, corresponding to 10′′ on the sky. It is "effective" in the sense that the gap includes columns 1 and 1024 of the devices from which no events are reported. This value for gap size is approximate and accurate to about 2 pixels. The actual gap sizes vary slightly; more accurate values of the ACIS-S chip geometry are given in a CXCDS CALDB file `telD1999-07-23geomN006.fits' (and higher versions) and incorporated in MARX version 3.0 and higher. Relative to S3, where zeroth order is normally placed, the ACIS-S chip locations are calibrated to better than 0.2 pixels allowing accurate relative wavelengths. A high-resolution spectrum is created by the projection of events along the dispersion axis and binning the events into energy or wavelength bins as shown in Figure 8.2. The HETGS line response function (LRF) at a given wavelength is the underlying distribution which would result if the source were monochromatic at that wavelength. The LRF function is encoded in the grating RMF files. Examples from flight data are shown in Figures 8.16 and 8.17. To a good first approximation the core of the LRF can be modeled as a Gaussian, parameterized by a Resolution , ∆E or ∆λ, given as the full-width at half-maximum of the Gaussian, 2.35σ. For the HETG the resolution is roughly constant when expressed as a wavelength. The Resolving Power , E/∆E = λ/∆λ, is a useful dimensionless measure of the spectrometer performance. Plots of the HETGS resolving power are presented in Figure 8.19. Figure 8.16: Representative Line Response Functions at two wavelengths for the HEG; 15 Å top, 6.7 Å bottom. Two of the bright lines in the HEG counterpart to the MEG Capella spectrum shown in Figure 8.2 have been fit by the instrumental LRF. The LRF is encoded in the HEG RMF created using CXC software and calibration parameters. Figure 8.17: Representative Line Response Functions at two wavelengths for the MEG; 19 Å top, 6.7 Å bottom. Two of the bright lines in the MEG Capella spectrum shown in Figure 8.2 have been fit by the instrumental LRF. The LRF is encoded in the MEG RMF created using CXC software and calibration parameters. The HETGS LRF is not simply a Gaussian and, as for other spectrometers, the response can be encoded at a higher level of fidelity through the use of response matrix files, RMF's. As explained below, the LRF (RMF) of the HETGS depends on all system components as well as the source spatial properties. Thus, LRF creation is carried out using a system model, e.g., the MARX ray trace software. 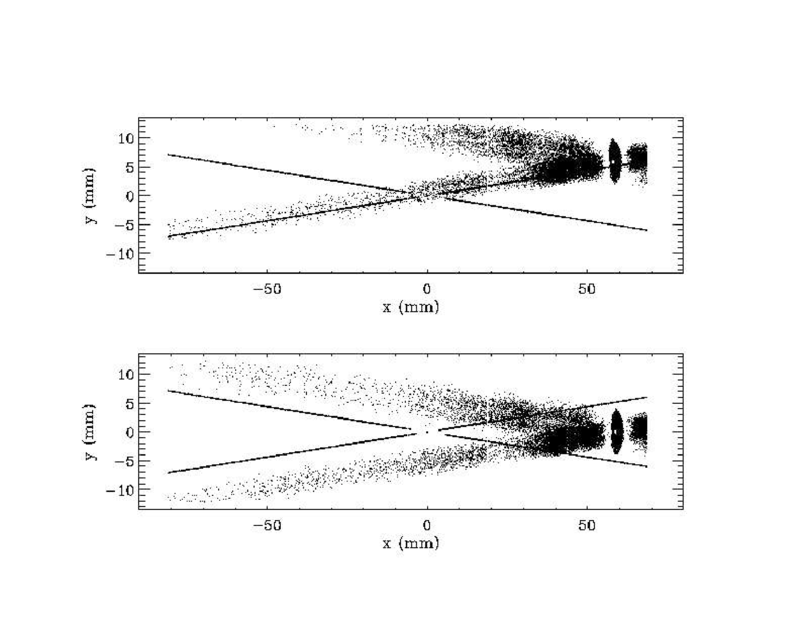 A set of RMF's for a point source and nominal telescope properties can be created based on the latest LRF library in the Chandra CALDB which includes two Gaussian and two Lorentzian components to describe the LRF as derived from realistic MARX simulations; for examples, see the fitted LRF models in Figures 8.16 and 8.17. The line response function can be decoupled approximately into three contributing components: the telescope PSF, the HETG effects in the dispersion direction, and HETG effects in the cross-dispersion direction. These are described below. With the exception of "HEG scatter", all effects described here are included in MARX version 3.0 (and higher) ray trace software. The HRMA PSF "anomaly" has not been found to cause a problem in analysis. For zeroth order images, it is a very subtle feature, the HETGS is generally used with ACIS and targets that are bright enough for grating spectroscopy generally show significant pile-up in the zeroth order images. See the ACIS chapter (Section 6.6.1) for more discussion of the possible impact on ACIS images. For dispersed events, the line response function has additional complication due to astigmatism, grating misalignment, and grating scatter that would make it very difficult to observe any effect specific to the PSF anomaly. The HETG itself does not focus the X-rays emerging from the HRMA. Rather, the Rowland design attempts to maintain the focal properties of the HRMA in the dispersion direction even as the focus is deflected by the diffraction angle β. The 1-D projection of the telescope PSF onto the dispersion axis is thus at the heart of the HETGS LRF and can be thought of as the "zeroth-order LRF". Ground testing showed no measurable effect on the telescope PSF due to the HETG insertion; this was used to good advantage for the now famous image of the Crab Nebula and its pulsar, Obsid 168, where the jet and swirling structure are seen in the zeroth-order HETGS image. 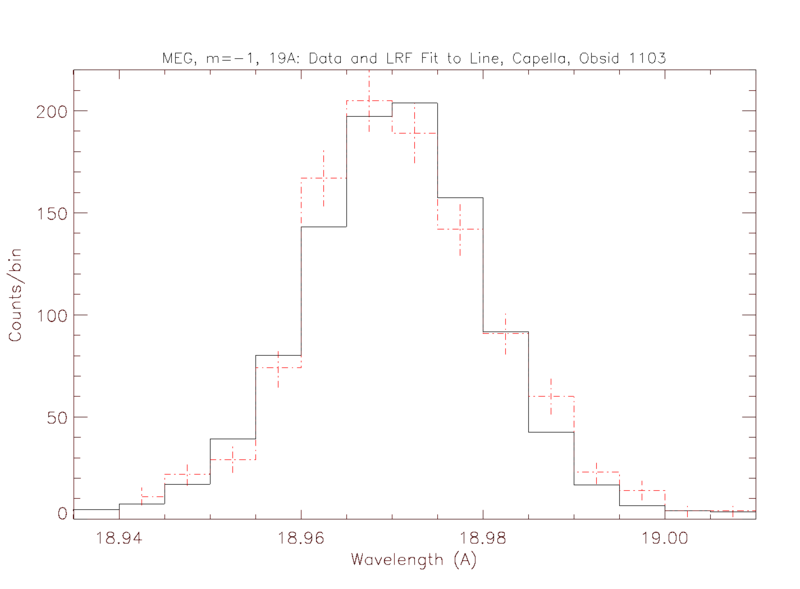 Thus, the zeroth-order image in an HETGS observation can be used to determine the telescope contribution to the LRF. Image quality depends on many factors, and so, while a nominal LRF can be modeled, the detailed LRF will be observation dependent at some level. Factors in the telescope PSF performance include: source size and spectrum, HRMA properties, focus setting, detector effects (e.g., pixel quantization), aspect solution and reconstruction effects, and data analysis operations (e.g., pixel randomization.) While all of these effects can be modeled, the "proof of the pudding" is in the as-observed zeroth order image. As an example, we show the results of the observation of Capella (Obsid 1318, Figure 8.1) in Figure 8.18. Both the zeroth-order event distribution and its 1-D projection indicate that the zeroth-order is heavily piled up with an unpiled event rate of order 10 events per frame time (per few square ACIS pixels). The wings of the PSF are visible but the core shape and intensity have been severely distorted. However, because the ACIS-S CCDs have their columns perpendicular to the (average) dispersion axis, the "frame-transfer streak" events or "trailed image" (see Section 6.13.1 in Chapter 6) can be used to create an accurate zeroth order LRF that is not affected by pile-up, as shown. For point-sources such as Capella, measurements of the FWHM of the zeroth-order streak events for selected observations over the first two years of HETGS operation show FWHM values generally in the range 1.46 to 1.67 ACIS pixels with an average of 1.57 ACIS pixels. Thus, by appropriately examining the zeroth-order image and its LRF, one can get a good idea of the expected width of a truly monochromatic spectral line, and determine whether or not any broadening seen in a dispersed order is a spectral property of the X-ray source. Figure 8.18: HETGS zero order and Frame transfer Streak (trailed image) for Obsid 1318 of Capella. The sky coordinates, X,Y, have been rotated so that the frame-transfer streak is along the Y′ axis, hence Y′ is parallel to the CCD detector Y axis ( CHIPY) and X′ is approximately along the average HEG-MEG dispersion axis. The left-side panels show the detected zero-order events and their 1-D projection; pile-up is evident by the enhanced wings relative to the suppressed PSF core. The right-side panels show the frame-transfer streak events and their 1-D projection; the dotted line is a Gaussian fit to the data. As mentioned, the profile in the dispersion direction defines the instrument spectral resolution , ∆E or ∆λ. The resolution function has two main terms with different dependences on energy: the image blur from the mirror described above and that caused by grating period variations which come in through the dispersion relation and are described here. From the grating equation, m ∆λ = p ∆βcos β+ ∆p sin β ≈ y ∆p/Rs + p ∆y / Rs , where p is the grating period, β is the dispersion angle, y is the dispersion distance and Rs is the (fixed) Rowland spacing . The two terms of interest are on the right side of λ/ ∆λ = (∆p / p + ∆y / y)−1. The grating fabrication process produced tightly distributed grating periods (∆p / p < 2.5×10−4) so that the first term is important in the spectral resolution only at very high dispersion (low energy). The mirror point response function has a nearly constant size ∆y and dominates the resolution over most of the HETGS band, as shown in Figure 8.19. At very low energies there is a contribution from variation in the grating periods. These variations are taken into account in the MARX simulator. Figure 8.19: HEG and MEG resolving power (E/∆E or λ/∆λ) as a function of energy for the nominal HETGS configuration. The resolving power at high energies is dominated by the telescope PSF; at low energies grating effects enter but do not dominate. 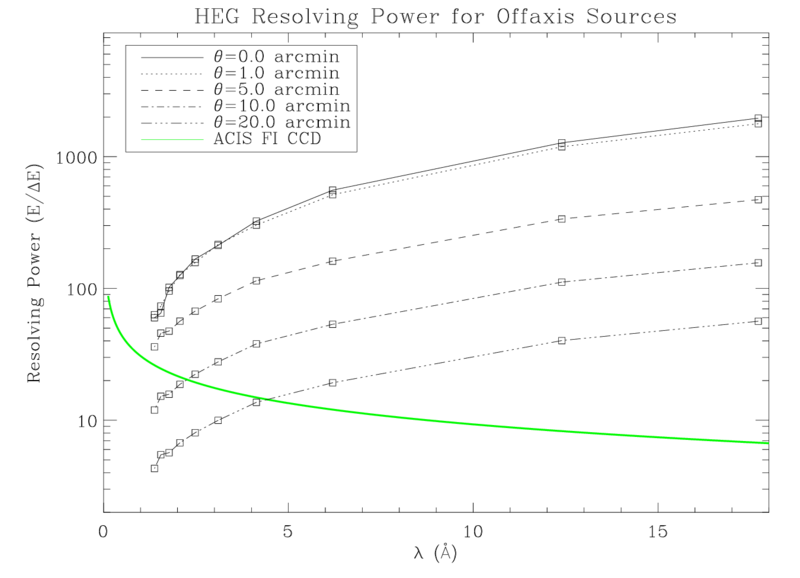 The "optimistic" dashed curve is calculated from pre-flight models and parameter values. The "conservative" dotted curve is the same except for using plausibly degraded values of aspect, focus, and grating period uniformity. The cutoff at low-energy is determined by the length of the ACIS-S array. Measurements from the HEG and MEG m=−1 spectra, e.g., Figure 8.2, are typical of flight performance and are shown here by the diamond symbols. The values plotted are the as-measured values and therefore include any natural line width in the lines; for example, the "line" around 12.2 Å is a blend of Fe and Ne lines. The solid line gives the resolving power encoded in the RMF s generated using the current CALDB. During ground testing, we discovered that there is a low level of incoherent dispersion (or "scattering") in HEG spectra. This scattering effect distributes a small amount of the flux along the dispersion direction. The total power involved is only 1.0% of the total in first order but the light is irregularly distributed between the coherently dispersed orders. Assuming that the power distribution scales with the first order dispersion distance, there is no more than 0.02% of the first order flux in any bin of width 0.01 λ. 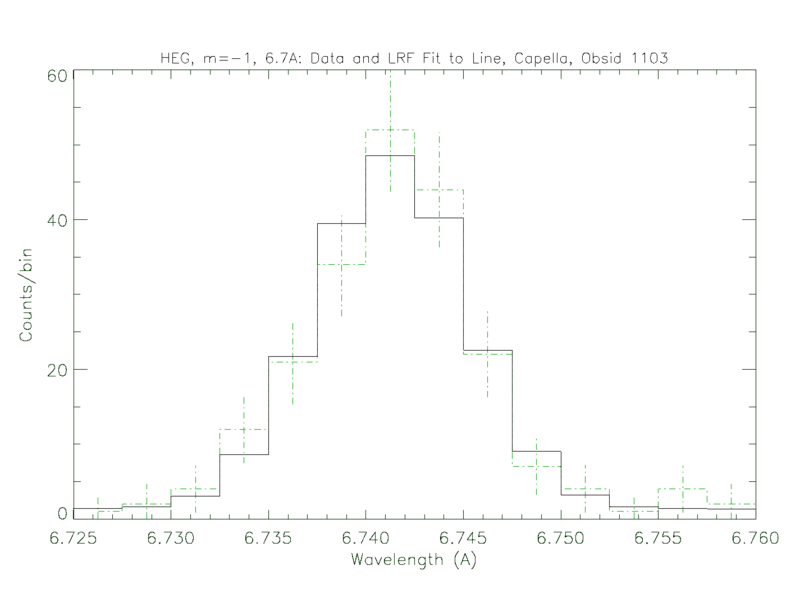 There has been no scattering detected in the MEG spectra to a level of order 100 times fainter than in the HEG. See the HETG Ground Calibration Report listed at the end of this chapter for further details. The effects of scattering from the grating are likely to be negligible for most observations. where m is the grating order, p is the grating period (see Table 8.1), R is the Rowland spacing of the HETGS (see Table 8.1), and F is the focal length of the HRMA. Eq. 8.2 shows that imaging is more important than instrumental broadening when F σθ >> σi; i.e., when a source is resolved. Instrumental and imaging terms dominate when m σv is small but as m increases, the line width is dominated by Doppler broadening. Thus, spatial extent can be ignored only if σv >> [3400/(m λ)] σθ km/s for λ in Å and σθ in arcsec. For a resolvable source with σθ = 1′′ and examining the Fe Kα line at 1.94 Å using the high energy gratings, then spatial extent is comparable to Doppler broadening when σv = 1750 km/s. In third order, however, this cross-over value drops to 600 km/s. It is clearly advantageous to examine the high order HETGS data where feasible. The profile in the cross-dispersion direction is dominated by three effects: mirror blur, grating roll variations, and astigmatism (as a by-product of the Rowland design which optimizes spectral resolution). The cross-dispersion profile that results from astigmatism is slightly edge brightened, but quasi-uniform, with a length at the Rowland focus of 2Rfy2/Rs2, where y is the dispersion length and Rf is the radius of the ring of facets on the HETGS structure and dominates the size of the cross dispersion profile at large dispersion. The spread of facet roll angles (defining the dispersion direction for each facet, and not to be confused with the spacecraft roll angle), ∆φ, contributes a cross-dispersion term of order y∆φ. Sub-assembly measurements predicted ∆φ= 0.42 arcmin rms. However, analysis of ground test measurements lead to a somewhat larger and more complex roll angle distribution for the gratings. In addition, six misaligned MEG facets were discovered during ground testing. The inferred facet roll angles were misaligned from the average dispersion direction by 5-23 arcmin. On average, each facet contributes only 1/192 of the flux at any given energy, so the cross dispersion profile has small deviations in the form of peaks displaced from the main distribution. To include explicitly the MEG misaligned gratings, MARX uses "sector" files which allow the specification of grating alignment and period parameters for certain regions (sectors) of each of the four shells. Using these files, the agreement between ground calibration and flight data is very good. For the MEG the misaligned gratings are explicitly included and the rest of the gratings' ∆φ term is modeled as the sum of two Gaussian distributions centered at +1 and -1 arcmin with respect to the nominal axis, each with an rms value of 1.5 arcmin. For the HEG a more pronounced bi-gaussian distribution is observed and modeled: the Gaussians are offset by -1.35 and +1.65 arcmin, each with a 1 arc minute rms, and in a relative ratio of 55:45. In each case, these effects are accurately included in MARX version 3.0 (and above). Flight data for the Crab pulsar (Obsid 168) are shown in Figure 8.20 for the MEG and in Figure 8.21 for the HEG. Note that these profiles are on top of a significant baseline due to the presence of the Nebula. The asymmetry in the MEG profile caused by misaligned gratings is quite clear at large dispersions. Finally, we show in Figure 8.22 how the total observed flux depends on the width of the extraction region in the cross-dispersion direction. The figure can be used to estimate the reduction in flux if analysis using a narrow extraction window, smaller than the nominal 4 arcsec full width, is planned. Figure 8.20: The cross dispersion profile is shown for eight slices of the dispersed MEG spectrum of the Crab pulsar. There is an asymmetry caused by misaligned gratings that becomes most evident at large dispersion. Figure 8.21: As in Figure 8.20, the cross dispersion profile is shown for the HEG spectrum of the Crab pulsar. The profile is symmetric but broadens significantly at large dispersion. Figure 8.22: Enclosed power distributions are computed for five wavelength intervals for both the HEG (top) and the MEG (bottom). The observation of Mk 421 (observation ID 1714) was used. The observation of extended sources with the HETGS adds complexity. Chiefly, the position of an event in the focal plane is not a unique function of the position within the source and the photon energy. The source extent, measured by the zeroth-order image size, can effectively increase in several ways: the telescope is out of focus, the source is off-axis, or there is a natural extent to the astrophysical source. Figure 8.23 illustrates the chief consequence for extended sources - a degradation of the apparent spectral resolution. 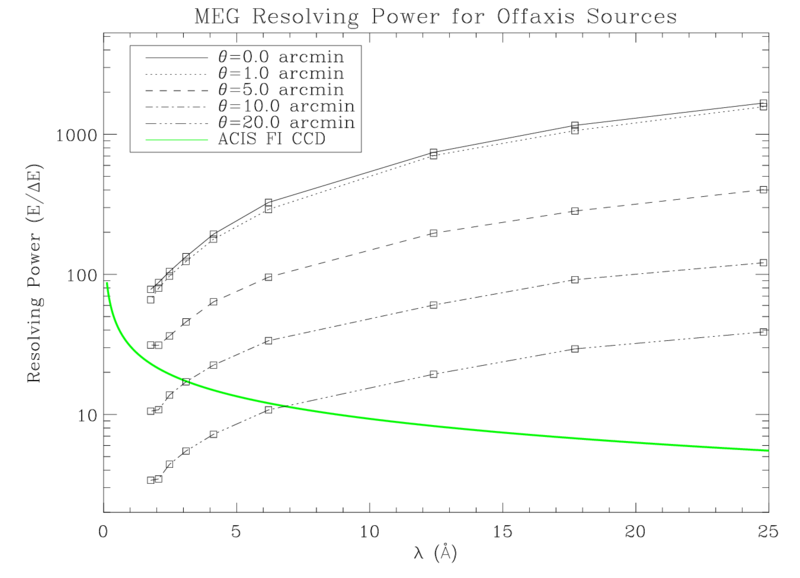 In Figure 8.24 similar resolution curves are shown as a function of the source off-axis angle. The discussion and plots above assumed that the source has no spatially dependent variations in the spectrum. The more general case of extended sources with spatially varying spectra is briefly discussed below in Section 8.5.3. Figure 8.23: The effects of source size on the apparent HETGS spectral resolution. This MARX simulation uses a cluster (of galaxies) Beta model for the surface brightness profile. The Beta model is parameterized by a core radius (rc) which represents the extension of the source. 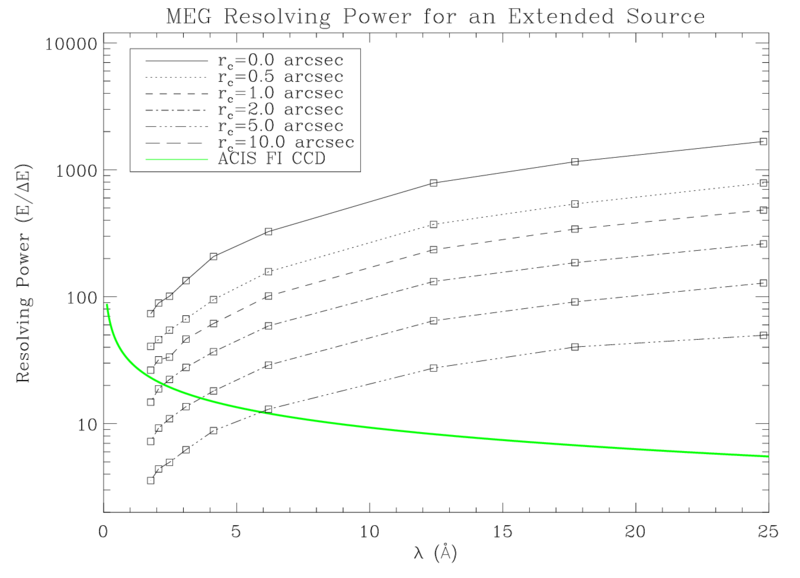 The effect on the apparent resolving power (E/∆E) is shown as a function of photon energy for source sizes of 0′′,0.5′′, 1′′,2′′, 5′′, and 10′′. The spectral resolution of an ACIS FI CCD near the framestore region is shown for comparison. Figure 8.24: The effects of off-axis pointing on the HETG grating spectral resolution. Using MARX, we have simulated an observation of a point source at increasing off-axis positions. 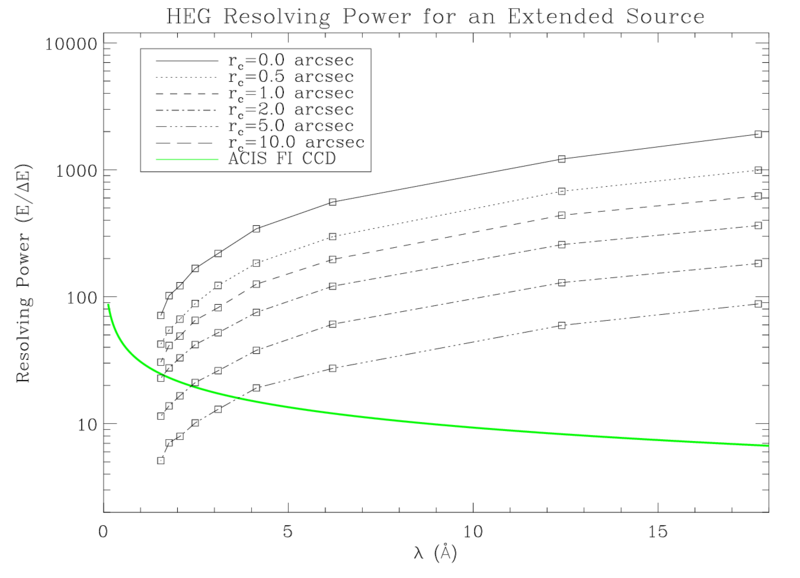 The effect on the resolving power (E/∆E) is shown as a function of photon energy for off-axis angles of 0′, 1′, 5′, 10′, and 20′. The spectral resolution of an ACIS Front Illuminated (FI) CCD at a point near the framestore region is shown for comparison. Since the HETG is always used in conjunction with a focal-plane detector, spectra from the HETGS will have background events determined by the detector's intrinsic and environmental backgrounds. The cosmic background, folded through the HETGS response, will likewise contribute background events. In addition to these detector-dependent backgrounds, there are additional grating-dependent effects such as scattering from the gratings which will produce extraneous photons in locations unexpected on the basis of the simple grating equation. One such effect is the scattering along the dispersion direction described in Section 8.2.2. Figure 8.25 shows the HEG and MEG count spectra of the background from an analysis by Huenemoerder (2017). Data from six long observations of faint or heavily obscured sources were used in a standard extraction, applying normal ACIS energy and grade filtering and spatial selection to avoid sources. This plot can be used to estimate the background in a dispersed spectrum at a particular wavelength for proposal purposes. "Streaks", short-lived events observed in the S4 detector, have been removed; otherwise, the background in +1 order would be significantly higher and would show more structure. This background is comparable to that obtained when the detector is stowed, indicating that the background is primarily instrumental, after filtering on ACIS energy appropriate for HETGS observations. Figure 8.25: The first orders' HETGS background count rate spectra, scaled to the spectral resolution along the dispersion axis and for the default cross-dispersion extraction width. The 1σ uncertainties due to counting statistics are shown at the bottom. The approximate locations of each CCD, from S0 at the left to S5 at the right, are shown by the alternating color bars for the MEG (upper bar) and HEG (lower bar). This figure is adapted from a memo by Huenemoerder (2017). 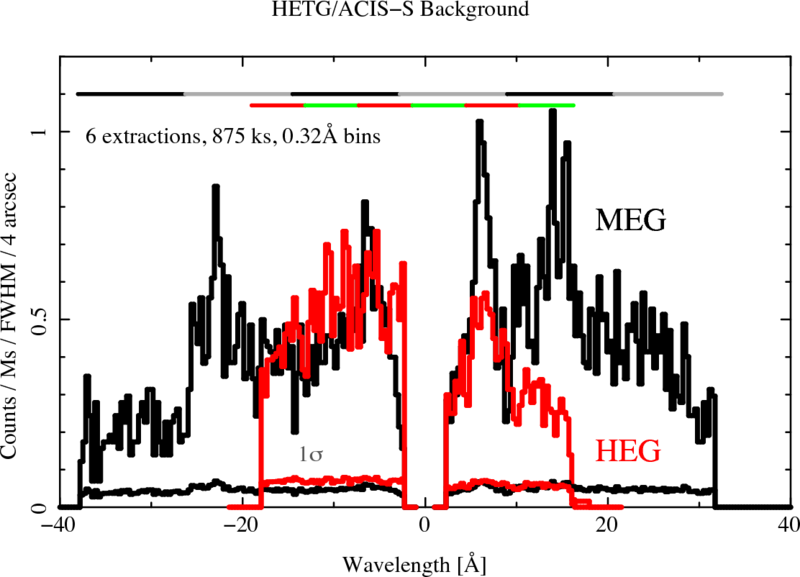 The HETGS-measured wavelength depends, as the grating equation implies, on knowing the diffraction angle, the diffraction order, and the grating average period. The angle depends on knowing the HETGS geometry, specifically the Rowland spacing and the ACIS-S pixel size and configuration. Preliminary comparisons between measured and expected emission line wavelengths indicates an agreement to the accuracies listed in Table 8.1. Systematic wavelength errors are now at the 100 km/s level. The calibration of the HETGS is based on extensive laboratory tests, system-level ground measurements, and flight data and analyses. Because the HETGS involves the HRMA, HETG, and ACIS-S as well as aspect system properties, calibration of all these components is important to the HETGS calibration. Details of the present state of the HETGS calibration are available at http://space.mit.edu/ASC/calib/hetgcal.html; see also Marshall et al. (2004), Weisskopf et al. (2004), and Marshall (2012). There have been no flight anomalies with the HETG per se. There have been some problems with the HETG and LETG grating insertion/retraction mechanisms. To date these have been limited to failure of some of the limit switches which are used to sense the gratings' position. In 2000-May there was failure of the HETG A-side electronics retraction limit switch indicating that the HETG was not retracted, when in fact it was. Switching to the redundant B-side limit switch worked until 2000-June when it too would not indicate that the HETG was retracted. Subsequently operational procedures have been changed to determine when the gratings are properly retracted. There have been no impacts to the science program. Because the HETG insert limit switches continue to function and because the HETG is inserted against a hard stop, these anomalies have had no effect on the HETG wavelength scale. With the exception of operational constraints on the focal-plane detectors, there are no operational constraints for the use of the HETGS from the proposer's point of view. The HETG is placed in the stowed position during passage through the radiation belts, a time when no data can be taken. Additional functional constraints include preventing both the HETG and LETG from being simultaneously commanded into position, which could cause a mechanical interference. Finally, a "failsafe" command, once used, will permanently retract the grating. A decision to issue the failsafe command will not be taken without a thorough review including the Chandra Project and NASA Headquarters. There are no data from the HETG itself. The data are generated by the focal-plane imager in its format (e.g. Figure 8.1). The HETG itself has only a few thermal and mechanical switch sensors associated with it. These sensors are examined routinely as part of the health and safety monitoring of the Observatory. HETGS performance is monitored by means of the calibration observations (Section 8.3). There is a negligible thermal time constant for the HETG to equilibrate from "near-wall" storage to "in-use" temperature environments. The temperature dependence of the resolution and energy scales have been minimized through use of low-expansion material ("Invar") and single-point-mounted facet-frames. Thus, the support structure may expand or contract, but the facets will not. Currently, the longest continuous observations are limited to the time between passage through the radiation belts (section 3.4.2). The main radiation concern for the HETG concerns the polyimide support material. Thin membranes of this material, used for proportional counter windows operating under a pressure differential, have been tested for the effects of radiation damage on leak rate. No increased leak rate was encountered after a dosage of 9 krad. In these tests the mechanical integrity of the material, the key issue for the HETG, was severely tested by the ability of the window to maintain the pressure differential of order one atmosphere. Loss of mechanical integrity has been reported in the literature, but only after exposures of 1000 MRads. The estimated proton dose to the HETG polyimide is of order 1 kRad per orbit when the HETG is inserted, and much lower values when HETG is in its stowed position. Current practice is to have the HETG retracted during radiation passages; however, even if it were left inserted the total exposure would be ≈ 1 MRad over 10 years, well below the 1000 MRad level. A secondary concern would be changes to the gold grating bars (which, when in place, face the HRMA) due to sputtering by particles, particularly for the high-aspect ratio HEG gratings. Diffraction order ratios are sensitive to these changes. To date, after flight experience and laboratory radiation tests, there is no evidence that this concern is other than intellectual. ACIS or HRC: ACIS provides energy resolution which is useful for order separation , background suppression, and discrimination between multiple sources. The HRC could be useful if high time resolution is necessary especially if the ACIS mode is not helpful for the observation in question. The HRC has not yet been used with the HETG and no calibration verification has yet been performed, so this detector is not recommended for general use. Operating mode of ACIS-S: The ACIS-S array can operate in many modes, giving control over e.g., the read-area, pixel-binning, and read-frequency. The selection of the appropriate operating mode and its ramifications for the experiment is one of the most important that the user faces. A careful reading of Chapter 6 is recommended. The proposer should pay special attention to the pros and cons of designating optional CCDs for their HETGS observation, as opposed to simply requesting the entire ACIS-S chip set. See Section 6.22.1 for details on designating optional CCDs. See Table 8.2 to determine the energies that correspond to various chips; for example for a Y offset of 0.0, the energy range of the MEG spectrum that would be found on S0 is 0.334-0.483 keV while the HEG spectral range is 0.668-0.965 keV. These energy ranges will not be found in the m = −1 spectra if S0 is dropped. Selecting the aimpoint: The capability of moving the SIM along the spacecraft Z-axis (the cross-dispersion direction) is useful for placing the image (dispersed spectra and zeroth order) closer to the ACIS chip read-outs. This placement minimizes the effects of the row-dependent energy resolution of the FI chips. However, due to contamination buildup, which is more substantial toward the edges of the array, we no longer recommend that the nominal aimpoint be shifted from the center of the detector. The aimpoint must be shifted, however, if an off-center subarray is selected (for example, in order to decrease the frame time). Orientation of multiple (or extended) sources: One may need to specify a restricted range of spacecraft roll-angles to avoid overlapping spectra from multiple targets in the field, or to arrange that the dispersed spectra from particular features of an extended target do not similarly overlap. Note that roll angle constraints usually will lead to restrictions on the dates dates of target availability. See Chapter 3. Offset pointing: Pointing offsets may be specified and used to include or exclude nearby sources, to keep an important spectral feature clear of the gaps between chips, to put a particular low-energy feature on the higher efficiency BI chip S1, etc. Offsets greater than one or two arcmin will, however, degrade the image quality - Chapter 4 - which in turn broadens the LRF (Section 8.2.2). ACIS subarray modes: One might wish to reduce the ACIS-S frame time e.g. to minimize the effects of pile-up. The user might consider using a subarray with the HETG, as described at http://space.mit.edu/ASC/calib/hetgsubarray.html. If the source is point-like, then a -3 mm SIM shift can be used. In this case, there are at least 6 mm of ACIS-S rows that may not be scientifically interesting (unless the user desires data from serendipitous sources). The reduced array could have 1024 - 250 = 774 rows starting at row 1 thus reducing the frame time to 2.5 s. The size of the minimal subarray depends on the low energy cut-off, E, below which the spectra are not of interest. To understand this better, please refer to Figure 8.1. The subarray must be large enough to encompass both HEG and MEG "arms". Larger subarrays are needed at lower energies where the arms are furthest apart. The minimal subarray size is ysub = 2*ybg + 32 + 389/E, where E is in keV, 32 pixels allow for dither, and ybg is the size of a background region on either side of the spectrum. The background region might be of order 70 pixels (about 10 times the spectrum's extraction width). The SIM should be shifted to center the spectra in the subarray by SIM_Z = 0.024 * (ysub/2 − 511 + 122θz) mm, where 511 is the row of the ACIS-S aimpoint and θz is an optional telescope Z offset. For E = 1 keV and θz = 0.0′, then ysub = 561 rows and the SIM shift is −5.53 mm. Example of a set of parameters: It is instructive to examine the ObsCat entry for observation ID 9703 which shows observation parameters and values. (See http://cda.harvard.edu/chaser/startViewer.do?menuItem=details&obsid=9703.) The main target is a quasar. The AGN is mildly absorbed, so there is flux of interest down to the MEG limit, hence chip S0 (where the low energy flux will fall) is designated as "yes", while S5, which is redundant with S1 and S0, is designated as "optional". A subarray is used to reduce pile-up. The SIM has been shifted in the Z direction to center the spectrum in the subarray and bring the zeroth order closer to the optical axis. This shift reduced the impact of row-dependent CTI in the FI-chips but contaminant absorption was larger for the MEG -1 order. Finally, a Y offset of 0.0 arcmin is used to keep the Fe-Kα region of the spectrum out of the S2-S3 chip gap in the HEG. Use of continuous clocking (CC) mode: this mode can be applied to mitigate pile-up in very bright sources. Most high resolution features will be unaffected. However, there are some additional science issues that should be examined. Based on HETGS observations, X-ray sources with fluxes less than 30 mCrab (1 Crab = 2.4×10−8 erg cm−2 s−1 in the 2-10 keV band) and with absorption columns of less than 1.5×1021 cm−2 should not show any significant differences in spectra taken in either TE mode using a 512 row subarray or CC mode. Such a subarray is regularly used for moderately bright sources observed in TE mode. For bright sources up to about 300 mCrab, we recommend the use of TE faint mode with four CCDs (S1 - S4) and a 350 row subarray. The data will be simpler to analyze but come with the following trade-offs: loss of the spectral range above 12 Å ( < 1 keV), some pile-up ( < 10%) in the 1.5-2.0 keV range, and frames may be dropped due to telemetry saturation. Telemetry saturation can be mitigated by using TE graded mode in some cases. In CC mode, the halo has less impact for harder spectra. For example, a spectrum that decreases in flux from 2 Å (6.4 keV) to 12 Å (1 keV) by more than two orders of magnitude is only mildly affected by the dispersed halo spectrum and the soft CC mode background, practically independent of source flux. 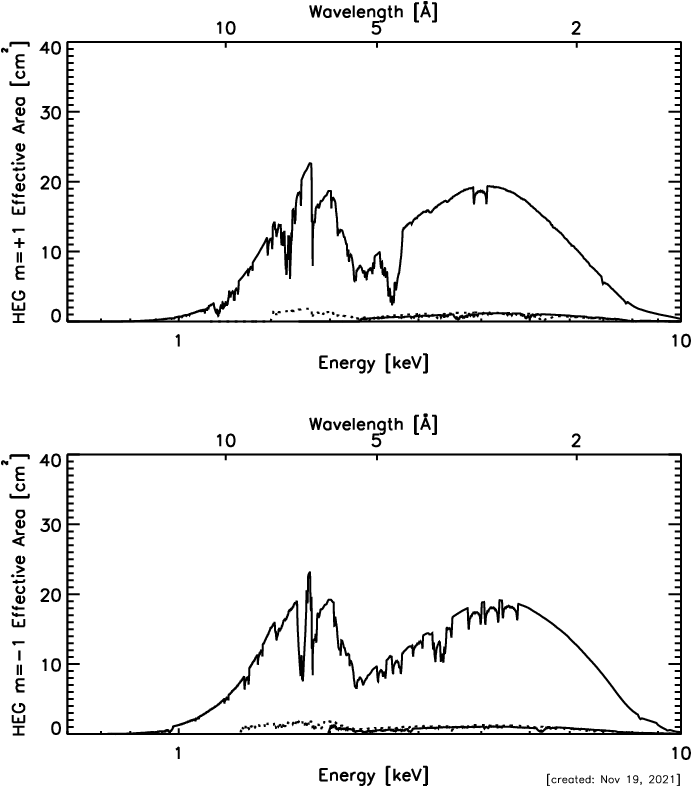 Softer spectra, as observed in sources such as Cyg X-1, Cyg X-2, or GX 339-4, on the other hand, are much more gravely affected. For the brightest sources, other mitigating actions can be taken. It is now routine to place a 10% window over zeroth order to reduce the fraction of telemetry occupied by zeroth order events (which are strongly affected by pile-up for bright sources anyway). In addition, one may turn off S0 and S5 or move zeroth order slightly off the array (i.e. using Z-SIM = −11 mm) so that only the HEG −1 and MEG +1 orders are observed. Using such techniques, sources up to 10 Crab can be observed in graded mode. If CC mode is also required for fast timing or to reduce pile-up in the dispersed spectra, significant modeling of the dust scattering halo may be required to interpret the resultant spectra for soft sources. Finally, flare events are not currently flagged in CC mode data, increasing background in FI CCDs. Also, if the particle background is particularly high, the flare event rate can be large enough to fill available telemetry and cause telemetry dropouts. Multiple sources in the field of view can also lead to effects which impact the observation. The position of a faint second source might be such that the zeroth-order image falls directly on the dispersion pattern from the prime target. In this case, the zeroth-order image of the second source appears as a line in the dispersed image of the prime target. The ACIS energy spectrum can be used to minimize the contribution to the measured dispersed spectrum of the target. Also, the lack of a feature in the other side of the dispersion pattern will indicate that the "line" is spurious. The dispersed MEG and HEG spectra of two sources will cross if the objects are fairly close. When the two targets are less than about 3′ apart, both will be nearly in focus, so the spectra appear like two flattened "X"s. Normally, the ACIS-S pulse heights of the events will be significantly different in the regions of overlap, so that one may distinguish the events from two sources in data analysis. There are specific roll angles, however, where the identification of the source is ambiguous; a rare occurrence, but one the user should be aware of. Figure 8.26: An idealized sketch of a `collision' between two sources separated by 3 arcmin. At the `collision' point, third-order photons from the on-axis source will have an energy 3x1.21=3.63 keV and ACIS can not distinguish these from the second source's first order photons, at 3.64 keV. An example is shown in Figure 8.26, where the MEG spectrum of the brighter object (source 1) overlaps the HEG spectrum of the fainter target (source 2). The first order energies at the overlap positions are a factor of 3 apart, so that E2 = 3 × E1. An ambiguity arises from 3rd order photons from source 1 at 3*E1, which cannot be discriminated by ACIS from photons of about the same energy but from source 2. For a given angular distance between sources, it is possible to specify the observatory roll angle so that collisions like the one shown in the top of Figure 8.27 are avoided. Figure 8.27: A simulation of spectral contamination caused by a second source in the field. The image of the dispersed spectrum from the second source is seen in the upper right hand corner for particular choice of roll angle. Note that the image is highly extended as the source is 20 arcmin off-axis. For this roll angle, there is significant overlap of the two images. In the lower panel we show the same situation, but for a different choice of roll angle. Here the overlap of the images is minimal and data analysis will be further aided through the use of energy discrimination provided by the ACIS-S detector. The proposer should also take into consideration sources, other than the target, that are within the field of view of the telescope, but out of the field of view of the detector. Parts of the image of the dispersed spectrum may still fall onto the detector. If this presents a problem, a sensible choice of a range of allowable roll angles might ameliorate the situation. The case of a simply extended, spectrally homogeneous source was described in Section 8.2.2, under the heading, "Extended and off-axis targets". Here more complex cases are briefly considered; generally these must be treated on a case-by-case basis. For extended sources with multiple condensations, careful selection of the roll angle (see e.g. Section 8.5.2) might make the data easier to analyze and interpret. It may also be possible to model the spectrum given information from the zero order image and/or a short ACIS exposure with the grating retracted. The ACIS spectrum can then be used as an initial guess in modeling the dispersed HEG and MEG spectra. The diffracted images of extended objects which lead to position-dependent spectra are complicated. The complexity indicates that information is present but extracting the information is more difficult than for a point or an extended source with a uniform spectrum. For example, the plus and minus order images may not have the same appearance. An example of this effect was seen in ground test data using the double crystal monochromator source; e.g., test image H-HAS-EA-8.003 which is schematically presented and described in Figure 8.28. For astrophysical sources, variations in temperature, abundances, Doppler velocities, cooling flows, etc. can all create spatial-spectral variations. For these complex objects general analysis techniques are not available and forward folding of the spatial-spectral model through MARX is the best way to study these effects and to plan potential observations. Figure 8.28: HETGS spatial-spectral effect example. In this schematic, a zeroth-order ring image emits at an energy which varies across the ring's diameter in the dispersion direction emitting lower-energy photons on the left and higher-energy photons on the right. The resulting diffracted images in ±1st orders have different appearances due to the spatial-spectral interaction. In the cross-dispersion direction, however, the images have the same extent. If the scientific objectives require detecting emission lines against a moderately bright source continuum, then the signal/noise ratio depends on the effective area of the instrument in combination with the spectrometer resolving power. Here, we compute the relative merits of each Chandra spectrometer in this context. Three cases where this analysis will not apply are when: (1) detecting weak lines that may blend with stronger lines, (2) observing significantly extended sources, and (3) observing lines that are substantially broadened. In case 1, the highest resolving power at the energy of interest would be indicated. Case 2 will require that the reduction of the grating resolution for extended sources, discussed in Section 8.2.2, be included. which can be compared for different instruments at the desired energy. Of course, all these considerations are tempered by the additional features of each instrument setup. For example, this calculation does not take into account instrumental background effects nor the additional continuum that may result from higher energy flux detected in higher orders when the LETG is used with the HRC-S. The reduction of the line detectability then depends on the source spectrum. For sources with spatial or spectral complexity, observation planning is best carried out using the MARX simulator to create a simulated data set. These data can then be analyzed with the same tools as flight data to demonstrate the feasibility of extracting useful results from a proposed observation. MARX is a suite of programs designed to simulate the on-orbit performance of Chandra. It is built around a core program or engine which performs a ray trace of photon paths through all elements of the Chandra observatory. The user specifies a file containing the spectral energy distribution of the source to be simulated and then selects a model for the spatial distribution of the source, which can be a FITS image. More complicated "user source models" allow simulation of sources with spatial-spectral variations. Once the source has been specified, MARX traces the path of photons through a model of the HRMA. Models for the High Energy Transmission Grating (HETG) and Low Energy Transmission Grating (LETG) can also be included and, in the focal plane, the user has the choice of all four Chandra detectors. The result of the simulation is converted with marx2fits into a FITS event file which can then be processed with standard CIAO tools. The latest capabilities and instructions for use of MARX are given in the MARX User Guide at the MARX web site, http://space.mit.edu/CXC/MARX/ and in analysis threads available at http://cxc.harvard.edu/ciao/threads/index.html. Canizares, C.R., Schattenburg, M.L. and Smith, Henry I. 1985, "The High Energy Transmission Grating Spectrometer for AXAF", SPIE, 597, 253. Canizares, C.R. et al. 2000, , 539, L41. Canizares, C.R. et al. 2005, , 117, 1144. Dewey, D., Drake, J.J., Edgar, R.J., Michaud, K., and Ratzlaff, P., 1998, "AXAF Grating Efficiency Measurements with Calibrated, Non-imaging Detectors", SPIE, 3444, 48. Davis, J.E., H.L. Marshall, M.L. Schattenburg, and D. Dewey, 1998, "Analysis and Modeling of Anomalous Scattering in the AXAF HETGS", SPIE, 3444, 76. Dewey, D., Humphries, D. N., McLean, G. Y., and Moschella, D. A. 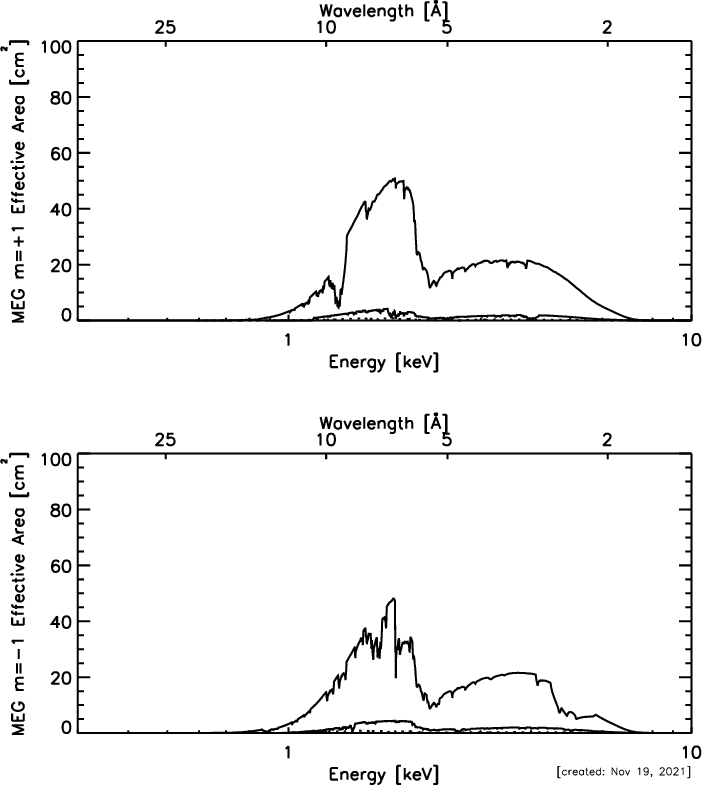 1994, "Laboratory Calibration of X-Ray Transmission Diffraction Gratings", SPIE, 2280, 257. Edgar, R.J., 2003, Chandra X-ray Center memo dated 6/9/2003, http://cxc.harvard.edu/cal/Acis/Cal_prods/qe/ACIS_QE_O_S23.ps. Edgar, R.J., & Vikhlinin, A.A., 2004, Chandra X-ray Center memo dated 8/11/2004, http://cxc.harvard.edu/cal/Acis/Cal_prods/qe/qe_memo.ps. Flanagan, K. A., Dewey, D. and Bordzol, L. 1995, "Calibration and Characterization of HETG Grating Elements at the MIT X-ray Grating Evaluation Facility", SPIE, 2518, 438. Flanagan, K.A., et al., 2000, "Modeling the Chandra High Energy Transmission Gratings below 2 keV" SPIE, 4140, 559. Huenemoerder, D.P., 2017, Chandra X-ray Center memo dated 7/7/2017, http://space.mit.edu/cxc/docs/hetg_bg/hetg_background.pdf. Madsen, K.K. et al., 2016, "IACHEC Cross-Calibration of Chandra, NuSTAR, Swift, Suzaku, and XMM-Newton with 3C 273 and PKS 2155-304", AJ, 153, 2. Markert, T.H., Canizares, C.R., Dewey, D., McGuirk, M., Pak, C., and Schattenburg, M.L. 1994, "The High Energy Transmission Grating for AXAF", SPIE, 2280, 168. Marshall, H.L. et al. 1997, "Towards the Calibration of the HETGS Line Response Function", SPIE, 3113, 160. Marshall, H.L., Dewey, D., Schulz, N.S., and Flanagan, K.A., 1998, "Spectral Features in the AXAF HETGS Effective Area using High-signal Continuum Tests", SPIE, Vol. 3444, 64. Marshall, H.L., D. Dewey, and K. Ishibashi, 2004, "In-Flight Calibration of the Chandra High Energy Transmission Grating Spectrometer", Proc. SPIE, Vol. 5165, 457. Marshall, H.L., Tennant, A., Grant, C., Hitchcock, A.P., O'Dell, S., and Plucinsky, P.P., 2004, "Composition of the ACIS Contaminant", SPIE, 5165, 497. Marshall, H.L., 2005, Chandra X-ray Center memo dated 10/14/2005, http://space.mit.edu/ASC/calib/heg_meg/meg_heg_report.pdf. Marshall, H.L., 2012, "Updating the Chandra HETGS Efficiencies using In-Orbit Observations", SPIE, 8443, 48. Marshall, H.L., 2017, Chandra Newsletter Issue 24, Spring 2017, "HETGS Update", http://asc.harvard.edu/newsletters/news_24/marshall.pdf. Schattenburg, M.L. et al. 1991, "Transmission Grating Spectroscopy and the Advanced X-ray Astrophysics Facility", Optical Engineering, 30, 1590. Schattenburg, M.L., Ancoin, R.J., Flemming, R.C., Plotnik, I., Porter, J., and Smith, H.I. 1994, "Fabrication of High Energy Transmission Gratings for AXAF", SPIE, 2280, 181. Schulz, N.S., Dewey, D., Marshall, H.L. 1998 "Absolute Effective Areas of HETG", SPIE, 3444, 160. Smith, M.J.S., & Marshall, H.L., 2012, "XMM-Newton - Chandra Blazar Flux Comparison", presented at the 7th IACHEC meeting http://web.mit.edu/iachec/meetings/2012/Presentations/Smith.pdf. Weisskopf, M.C. et al. 2004, "An Overview of the Performance of the Chandra X-Ray Observatory", Experimental Astronomy, Vol. 16, no. 1, 1. "X-ray Spectroscopy in Astrophysics", 1999, Springer-Verlag, ed. van Paradijs, J., & Bleeker, J.A.M.